Hasse's lifespan covers a period "between the epochs": he was almost a generation younger then Bach and Handel, who were born in 1685, but on the other hand a generation older than Haydn (b. 1732) and even two generations older than Wolfgang Amadeus Mozart (b.1756). contemporaries he was famous beyond all others. Hasse was not just any musician: he was one of the formative composers of his time, especially in the decades between 1730 and 1760. 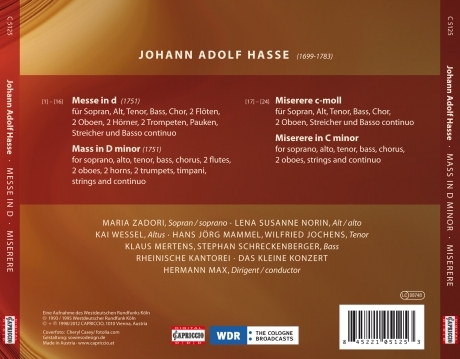 Hasse's Mass in D minor is a „number Mass" typical of its time, in which the five sections of the Ordinary of the Mass (Kyrie, Gloria, Credo, Sanctus, Agnus Dei) are subdivided into fifteen smaller passages of text with their own musically independent movements. 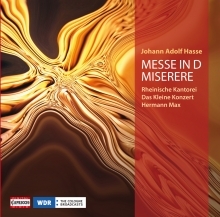 In style the Mass displays a trend similar to the Italian but also Hasse's personal style become clear: with virtuosity, elegant melodic lines coupled with the course of the voice parts, harmony „pre-classically" two-dimensional, at the same time as rich in chromaticism, chords of the seventh and bitter suspensions.